Effective communication is the key to encouraging healthy behavior. Documenting a revolution in both theory and practice, Johns Hopkins University experts show that communication leads the way to healthy reproductive health and family planning behavior. They explain why communication makes so much difference and how communication programs can be made to work. This book presents a compilation of lessons learned by the Johns Hopkins Center for Communication Programs and its partners over 15 years of developing and implementing family planning communication projects campaigns in Africa, Asia, Latin America, and the Near East. An introductory essay provides an overview of family planning and communication worldwide and outlines the role of theory-based communication programs. 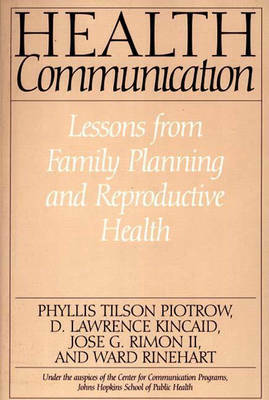 The main part of the book presents lessons learned in the field about the process of designing and carrying out family planning communication projects. More than 60 lessons are presented, with descriptions and analysis of projects illustrating each lesson. A final essay explores the current and future challenges confronting family planning educators and other public health communicators.